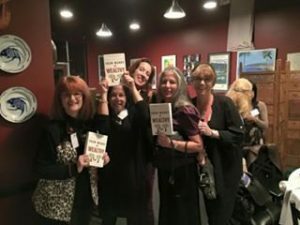 I went to a networking meeting of WRS – Women’s Referral Service – one night in Beverly Hills, and I reveled in the team of wonderful people that gathered there. I’ve been a member of this group for 28 years, so every time I go to a meeting, I see old friends and make new ones. We each get to give a 30-second introduction to our services and products, and then we have an additional 10 seconds to give a testimonial to someone else in the room. It’s quite wonderful to see a client of yours stand up there and then say they appreciate how much you’ve helped them, and it’s fun to be able to return the favor and highlight someone who’s helped you. That’s support. And that’s love. For those in the Los Angeles area, visit www.WorthwhileReferralSources.com for locations and dates of the next WRS meetings. I will be at the Marina del Rey brunch on Saturday, September 19th and the South Bay WRS Women in Business luncheon on Wednesday, September 16th. I’m also a proud and happy new member of the eWomen Network in Orange County. They are a lovely group of talented, supportive, creative women. Their next meeting is Thursday, September 10th and I’m looking forward to a great luncheon and making new friends. Would love to see you there!